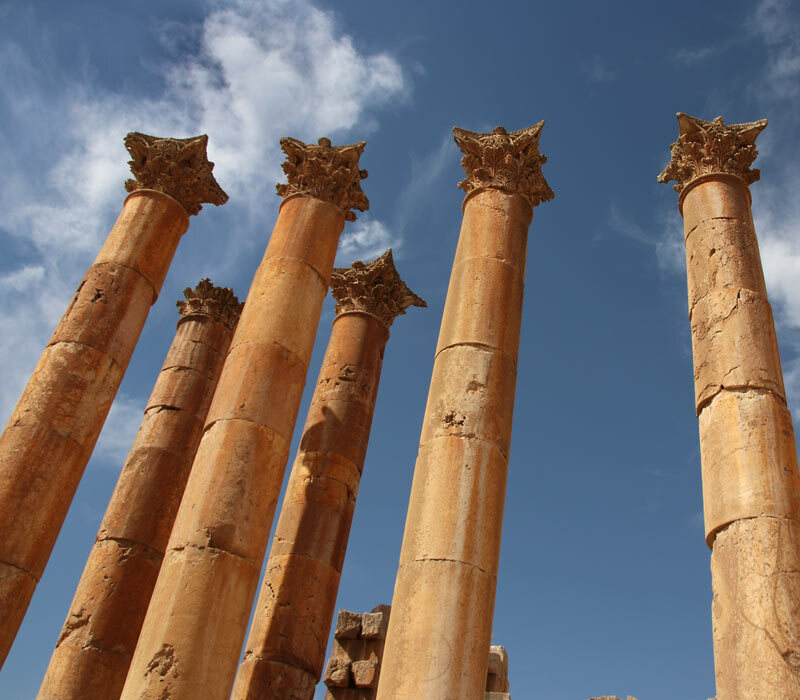 Gerasa in present-day Jerash is one of the largest and best-preserved late antique cities in the Middle East. 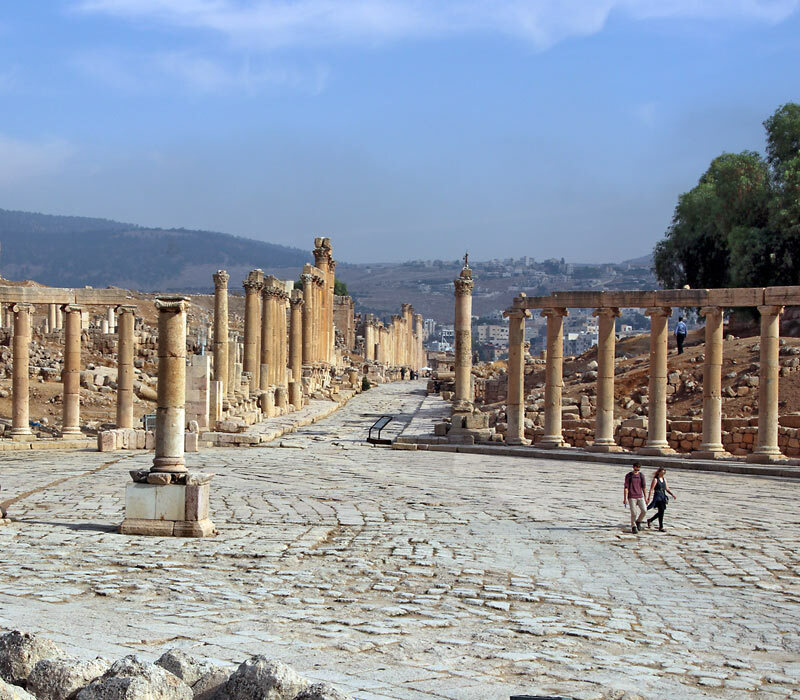 Magnificent colonnaded streets and plazas, triumphal gates, two imposing temple complexes and amphitheaters, the remains of numerous early Byzantine churches and Umayyad buildings in the hilly landscape along a wadi, make Gerasa one of Jordan's favourite destinations. One of the largest and best preserved ancient bathing complexes in the Orient. On the eastern bank of Wadi Jerash, outside of the fenced archaeological site. Spectacular findings in the Great Eastern Baths. Information, photos, video interview with archaeologist Prof. Dr. Thomas M. Weber-Karyotakis. 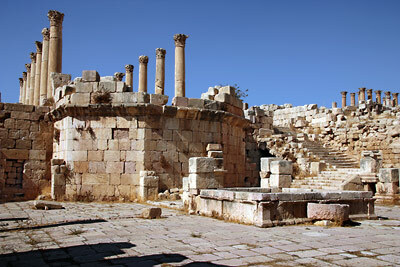 Jerash is the Arabic version of Gerasa, which in turn was a Hellenized form of the original Semitic name Garshu. 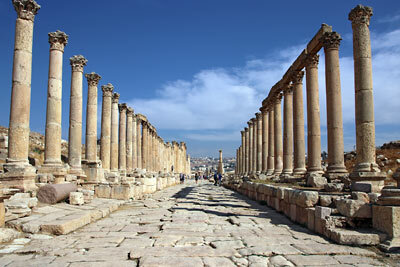 Jerash-Gerasa is located in a fluvial valley in the middle of a green hilly landscape with fertile soils. The agricultural use of the area was already a basis of prosperity in ancient times. Another lucrative source of income was the iron ore mines in the northern Ajloun mountains. 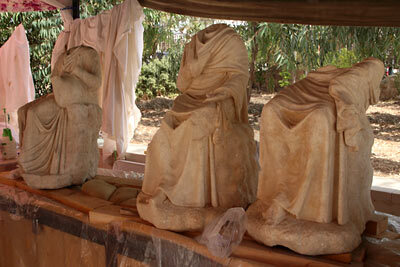 Gerasa also maintained prosperity through ceramic manufacture and its trade during the Byzantine period. Thus, a small settlement developed into the magnificent Greek-Roman city complex of the 2nd century AD, to which almost twenty Byzantine churches were added by 600 AD, and then numerous Umayyad buildings in the 7th century. Ancient Gerasa is divided in two by the Jerash Wadi. On the east side used to live most of the inhabitants, while the west side was the religious, administrative and economic center. This western part of the city has remained so authentically preserved, because it was abandoned by the inhabitants after the severe earthquake of 747 AD, and for ten centuries, hardly any structural or other interventions were done there. The earliest verifiable settlement - piles of Neolithic flint tools were found east of the Hippodrome and the Hadrian Arch. First historically documented mention of Garshu, as its original Semitic name was, during the reign of Ptolemaios II Philadelphos (ruled 285 - 246 BC), when the place was a Ptolemaic stronghold. When the Seleucid Antiochos IV (ruled 175 - 164) reigned the area, the place was renamed in Antioch on the Chrysorhoas. Chrysorhoas = gold river, was the name of today's Wadi Jerash. With the conquests under the general Gnaeus Pompeius Magnus (106 - 48 BC), Rome and then the Eastern Roman Empire also gained power in Transjordan for several centuries. Antioch on the Chrysorhoas is renamed Gerasa, the Hellenized version of the ancient Semitic name Garshu, and becomes part of the Roman Provincia Syria. Pompeius recognized the (relative) autonomy of a number of Hellenized cities, which later formed a community of interests, known as the Decapolis (a term that only emerged 100 years later) and to which the city of Gerasa belonged as well. Gerasa became prosperous particularly through agriculture on the fertile soils of the surrounding area, and iron ore mining in the hilly region of Ajloun. Like other Decapolis cities, Gerasa benefited from the expansion policy of the Roman Emperor Trajan (ruled 98 - 117 AD), who sealed the end of the Nabataean kingdom in 106 AD, incorporating it into the Provincia Arabia. In the following years, new trade routes emerged, such as the Via Nova Traiana, completed in the year 114, a 430 km long north-south connection between Bostra in the Hauran region, the capital of the new Provincia Arabia, and Ayla on the Gulf of Aqaba. In 129/130, Emperor Hadrian stayed in Gerasa, and probably also conferred honorary rights on the city. In the following decades the building activity increased strongly. The street grid with a main axis in north-south direction (slightly tilted) crossed by east-west axes, originated about 170 AD, during the city's heyday. 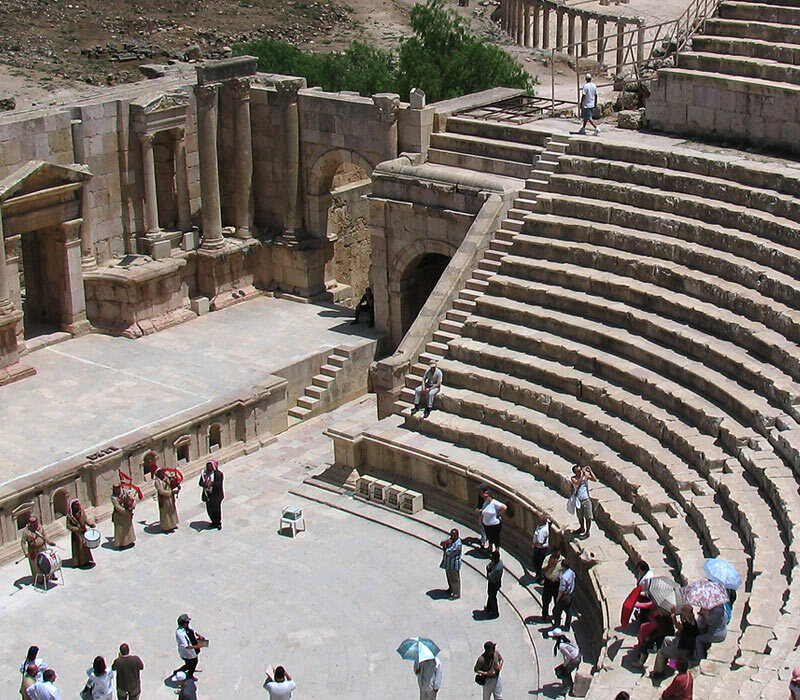 At the turn of the 3rd century, Gerasa could have reached up to 25,000 inhabitants. Turbulent times began in the 3rd century, and the building activity in Gerasa stopped to a large extent. The Roman Empire was shaken by internal struggles, and in its Eastern regions it was confronted, time and again, with military clashes with the Sasanian Empire (Persia). From 390 to the Mid-4th century, the city wall -started between 50 and 75 AD- was fortified and extended. 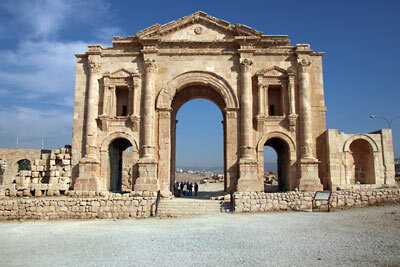 It used to enclose the ancient Gerasa on both banks of the Wadi Jerash, and was 3460 m long. In the Byzantine Era, Christian sacred buildings were built throughout Jordan, but nowhere as splendid and numerous as in Gerasa, however older buildings were exploited for this purpose. The oldest church is the so-called cathedral, built 450-455 AD. Most of the church buildings in Gerasa date from the 6th century. The archaeologists have found a total of 19. In 614 Gerasa was conquered by the Sassanids until they were defeated by the troops of the Byzantine ruler Heraclius in 629. With the victory of the Muslim army in the Battle of Yarmouk in 636, the Byzantine (Eastern Roman) Era ended in Transjordan, announcing the dawn of an Islamic Era. 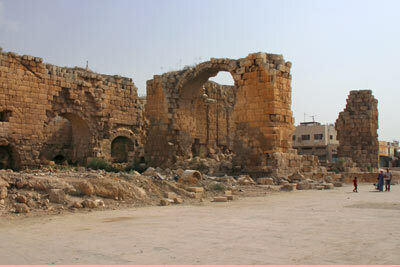 Although there was some destruction in Gerasa during the conquests, it was a plague outbreak that most affected the city. Gerasa continued existing, and was able to maintain certain prosperity through ceramic manufacture and its trade, among other things. Until the first half of the 8th century, numerous buildings were repurposed and new Umayyad buildings arose. After the devastating earthquake of 747, the inhabitants abandoned the city. Medieval sources describe Gerasa as deserted. The German traveler Ulrich Jasper Seetzen visited Gerasa and expressed his enthusiasm about the ruins. On the orders of the Ottoman Sultan Abdul Hamid II, Circassian people are settled in Gerasa, who used elements and materials from the ancient buildings to build their houses in the east of the city. But the part on the western bank of the river remained almost unoccupied and therefore well preserved. The systematic archaeological research of Gerasa began with several years of Anglo-American excavations under the direction of Carl Hermann Kraeling.